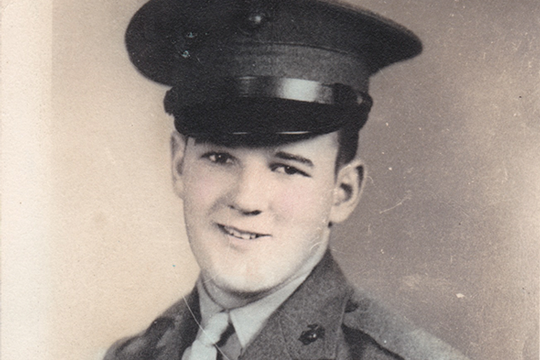 My father lived through the Great Depression and saw action with the Marines during World War II (that’s his picture above). So he had a view of life shaped by those experiences that few can relate to today. After fighting on Okinawa, he was sent to northern China as part of a U.S. occupation force at the end of the war. Not many Americans realize it, but U.S. Marines occupied parts of northern China from 1945–49. There my father witnessed the effects of the Great Chinese Inflation that helped lead to the victory of Mao Zedong and the Communists over the Nationalist forces of Chiang Kai-shek. The Nationalist government printed vast amounts of paper money to fight World War II against the Japanese. And the civil war years afterward saw runaway inflation. It destroyed much of the Chinese middle class and drove a large portion of China’s rural population into grinding poverty. That breakdown of society contributed to the victory of the Communists. So my father saw what paper money, unbacked by anything of real value, could do to a nation. And I’ll never forget an important lesson in money my father taught me when I was a young child. This was in the late 1950s and I was about 9 years old. My father sat at the kitchen table and pulled out two $20 bills from his wallet and put them on the table. One was a standard Federal Reserve note like we have today. But the other was a silver certificate. He always carried a $20 silver certificate in his wallet. Then he showed me the other bill and asked, “What does that say?” It simply said, “Federal Reserve Note” and “This Note Is Legal Tender for All Debts, Public and Private.” Nothing about paying silver or anything else on demand. And he left it at that. Not surprisingly, I guess, my father also believed that all politicians were crooks. My father never let go of that silver certificate. I was more interested in buying candy with silver at the time than anything else, but I never forgot that lesson. Up until the early ’60s, a quarter also used to be a silver round. Then they started replacing silver with copper and nickel in 1965. I remember taking a quarter and holding it sideways. You could see the little copper on the inside if it was worn. I remember thinking that was really shabby. I’m sure I got that idea from my father. The point is silver once served an important monetary function. It no longer does. That’s just another symptom of how monetary elites have driven precious metals from the monetary system. Now money is mostly digital and can be deleted at a single keystroke. You can’t delete silver or gold. Below, my colleague Byron King shows you just how much silver and gold have preserved wealth over long periods of time — unlike paper and digital money. Read on. Have you ever seen 100 ounces of pure silver, .999 fine? The typical bar is about the size of a small brick. Here’s a photo. 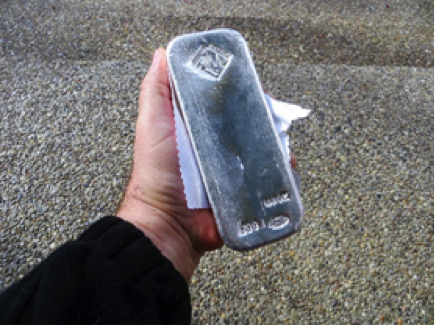 According to a recent listing on eBay, this 100 ounce, Johnson-Matthey bar is worth about $1,900.00. There’s nothing fancy here. The value of this brick is all about silver content, with a slight premium for the name Johnson-Matthey, among the best refiners in the world. Now, let’s look at another “100-ounce” version of silver. Here’s a U.S. Treasury “silver certificate,” Series 1891. It’s a beautiful piece of paper, in my opinion, and quite rare. What is this worth today? How rare? Every year, perhaps a few dozen $100 silver certificates trade, world-wide. Not long ago, I saw one priced at $10,000 on an antiquarian-oriented web-site; an amount that represents the extreme scarcity of certificates like this. In other words, the certificate represents 100 ounces of silver coin, on deposit at the U.S. Treasury. The document bears a unique serial number, and has the “old” seal of the U.S. Treasury on it, shown in red ink. It’s very, very official. Indeed, back then, the U.S. government — and citizens, and certainly banks — were quite serious about the value of their money. Silver and gold were money; and merely for convenience, the Treasury (NOT a so-called “Federal Reserve”) issued certificates backed by silver and gold. None of this “Federal Reserve Note” nonsense, with which we live today. Thing is, however, you’ll never trade this piece of paper into the U.S. government for real silver. Not anymore. The certificate is valuable only because it’s old and rare; not because it’s backed by any silver, or anything else of true, long-lasting value. The silver certificate may as well be valued as art, as opposed to money. I’m mentioning this monetary history because it’s inconvenient history. It’s inconvenient to “money people” today, because U.S. currency is no longer backed by silver or gold; just the government “promise” that somehow or another, U.S. dollars represent things of value. It “is” because we say it is. The counter-argument is that U.S. currency is just paper with greenish ink printed on it. “One dollar” paper is the same as “five dollar” paper, or “ten dollar” paper, etc. The only difference is the imagery printed on that paper. There’s no silver or gold on deposit anywhere, backing anything. The environment for gold is the best it has been in years. This is because the international monetary elites have embarked on a path to weaken the U.S. dollar against other currencies. This is designed to push inflation in the U.S. toward the Fed’s target level of 2%. Inflation hasn’t come close to the target in five years and now the Fed is getting desperate. Currency wars are the last resort when all else fails. Helicopter money is not far behind. Whatever makes the dollar cheaper makes the dollar price of gold higher. History bears this out. The all-time low for the dollar was August 2011. That was also the all-time high for gold at $1,900 per ounce. No coincidence there. It’s that simple. Now those forces are in play again. Indeed they are “in play again.” Think about what Jim just said. At 2% inflation, money loses about half its value in 35 years. It loses another half in the next 35 years. Then a further half of what remains in 35 more years. And so on. Let’s say your great grandmother had $100, back in 1891. At 2% inflation, 35 years later, in 1924, that sum was worth only $50. By 1959, another 35 years, that $50 was worth $25. By 1994, a third 35-year period, that $25 was worth $12.50. By now — about 22 years on — that $12.50 is worth $8.00 or so. Do the math… it’s a loss of 11/12ths of original value in 125 years. Then again, if great-grandmother had stashed her money as 100 ounces of silver back then, at the very least the metal would be worth about $1,900 today, per that bar I showed you above, based on the eBay valuation. So with “real” precious metal, you can preserve value over time, compared to losing almost all value over time. That’s the idea. When it comes to gold miners, we all know that when gold goes up, the price of mining stocks goes up faster. That has to do with the role of fixed costs versus variable costs in mining company income statements. Once fixed costs are covered (a difficult challenge) mining profits can drop to the bottom line directly because variable costs are low in relation to fixed costs. Since stocks are priced on a multiple of earnings, the stock price goes up faster than earnings. That’s the environment we’re in today. A third factor moving the market in addition to higher gold prices, and higher gold company earnings. Big mining companies are looking at the same math. A big mining company can buy a small mining company and add to its own bottom line without lifting a finger. The stock multiplier effect kicks in for the large miner and increases its stock price too. That increase in valuation can “pay for” the acquisition. It’s almost like getting free gold! That’s how gold and stock markets interact. Great points by Jim. I call it the “mining slingshot.” That is, when gold-silver prices rise, cash flow increased for mining companies. As long as companies keep their costs under control, most of that extra cash hits the bottom line. Then we see share values accelerate upwards. Not all companies are created equal. The idea is to screen, screen and screen some more. That’s what Jim and I are doing in our service, Gold Speculator.